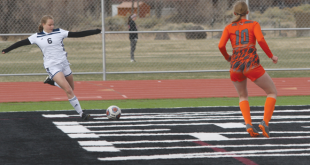 The Crested Butte Titans opened the 2018 season with an impressive win over Caprock Academy but coach Morgan McNallie still saw plenty for the team to work on as they prepared for their next match against perennial league powerhouse Sanford. The team went immediately to work in an effort to put up a fight and possibly pull off a win over the Sanford program. “Practices and training were efficient and we worked on a lot of things that were lacking in the Caprock game,” says McNallie. But the true test comes in match play and the Titans entered the Sanford gym poised and ready, despite the fact that Sanford has handed Crested Butte numerous defeats over the past several years. “I actually think the varsity girls showed confidence and had a positive attitude going in,” says McNallie. Unfortunately, the match result didn’t play out as hoped—the Titans battled all three sets but ultimately fell 25-21, 25-21, 25-18. Still, the Titans were in each set until the end, battling for every point before falling in the end. While McNallie admits winning is a great result, there was plenty for her team to be excited about in the match against Sanford. 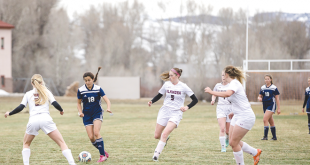 The Titans will hit the road on Friday, August 31 to face Custer County and then will return home to play in a tournament in Gunnison on Saturday, September 1, with matches at 9 a.m., 11 a.m. and 1 p.m.
“I’m looking for them to remain positive, work as a team, pick up their game and minimize small errors as much as we can,” says McNallie.